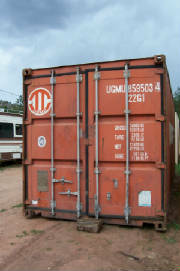 Sea, marine, or steamship containers, called also conex containers are economical alternatives to wooden sheds for securing personal or business belongings. Also used at construction sites, as small repair shops, trading posts, temporary offices, these containers can be converted into safe mountain & hunting cabins. They are well constructed with a metal frame and heavy duty wood floor with a double opening swing open door. This box would be ideal for a backyard or parking lot storage room. It is 8 foot wide, 8 foot tall and 20 feet long. Ask for a FREE LOCAL delivery. at Big Pines Storage and RV Park in Crystola. Specifications: dimmensions 20' x 8' x 8', weight 4500 lb, steel frame, marine grade wooden floor, double-hinged doors, elastomeric roof coating, reinforced fittings at all eight corners for loading and handlling. Slide off delivery is available. These units take special delivery equipment and require space to deliver and place them at your location. Unloading from the truck is done pulling out the trailer from under the container. You must have about 15' clearance on each side of your drop site.